To indulge, or not to indulge. That is the question. I had a dream that this trip would be the impetus of a physical transformation for my family. We would walk everywhere, eat fresh healthy food, and return to the U.S. as happy shadows of our former selves. So far? Not so much. On the contrary, we are constantly surrounded by food temptation. We have tried, wherever possible, to cook fresh, healthy food at home and only eat at local restaurants once a day, tops. But even when you do all that… The drinks that you have to order! (By “drinks,” of course, I mean beer. It is Europe, after all. At home, we would just drink water, mostly because we are cheap, but as an added benefit, it’s healthy, too.) The pastries! The snacks we are offered when we visit or play games with people! The cool stuff you see in the supermarket and want to try! It is very hard to resist the temptation. And, I ask myself, should we even try to resist? Food and drink are intrinsic parts of the culture that we are here to sample, after all. We can’t get them at home, so why not enjoy them while we are here? See, I believe that getting all three of us to the healthiest state possible is of utmost importance, so every time we indulge, I feel guilty. There’s nothing like trying to enjoy the cuisine of a foreign land while hating yourself for doing so, let me tell you. I keep reminding myself that this trip is a special case. Most people can go on vacation and overindulge for a week or two and think nothing of it. I, on the other hand, need to think something of it. I have been moaning to David about this dilemma, and in very excellent “Let’s solve this” style, he assures me that there are still two months left and we can mend our ways and get perfectly fit and healthy by eating nothing but protein and vegetables except for the pastries and beer that he still wants to sample in every country. In other words, you will still be able to recognize us when we get home. I’m grateful for bike rentals. I get a little internet time while D and Q are out riding. Of course, most of it has to go to finding a place to stay in Paris, but I can pop in here and try to get something written. A little “Me Time,” you might say. 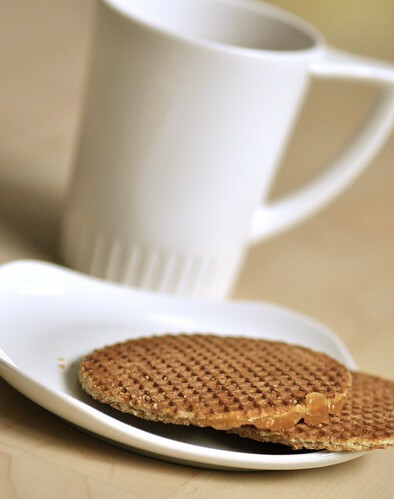 it would not be holland without stroopwafels.